Far Cry 4 game is under development? There are a lot of rumors and speculations about the fourth instalment of the famous Far Cry game series. And it seems that today we will tell you one more. So, yesterday American composer Cliff Martinez (famous for his soundtracks to the films Drive, Only God Forgives, Solaris and many other projects) said in an interview with Lost in the Multiplex, that now he is working on a Soderbergh’s TV series called “The Knick” and video game titled Far Cry 4. 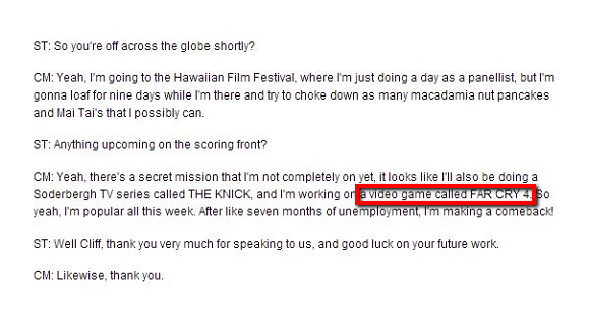 Although this quote has been removed soon from the interview, though it can be assumed that it contains a good deal of truth and in the near future Ubisoft will make the official announcement of the fourth part of this famous first-person shooter that is awaited by a huge number of gamers around the world. If summarize everything we know about this project, then we are sure that Far Cry 4 will be set on another gorgeous tropical island, dotted with a wide variety of traps. As for the graphics, it should be more realistic. Do you expect the next instalment of Far Cry game series? How will, in your opinion, Far Cry 4 game look like? You can leave your opinions at the bottom of the page.